The first collaboration between Gus T. Cecchini of GTC Knives and Zero Tolerance Knives is nothing short of amazing and now it is back for a limited edition Sprint Run in BlackWash 20CV and deep Bronze Anodized Titanium. The 3.75 inch blade and equally striking titanium handle get their handsome good looks from Gus' wildly popular Airborne model and deliver ZT quality materials and fit & finish. 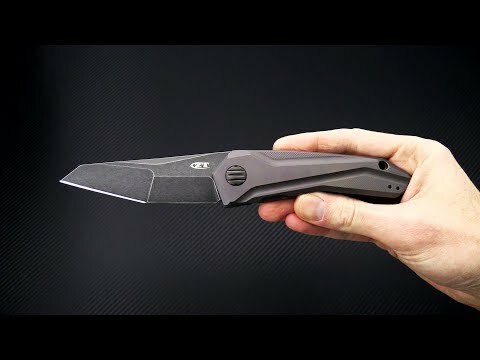 With the help of GTC, ZT brings the heat with the 0055 Spring-Loaded Tab Flipper. Brand new direct from Zero Tolerance Knives. Blade: Like Gus' designs the 0055 is highly modern and highly motivated. Its compound grinds are striking and offer two blade cutting angles while maintaining a piercing modified tanto intimidating tip. A fully Blackwashed finish means work and isn't afraid to get dirty. What's most intriguing about this design is the use of Gus' SLT or Spring-Loaded Tab system that utilizes a quick two-stage flipping process. Think of it as a two-stage rifle trigger tab that is pulled out and then down in flawless flipping harmony. 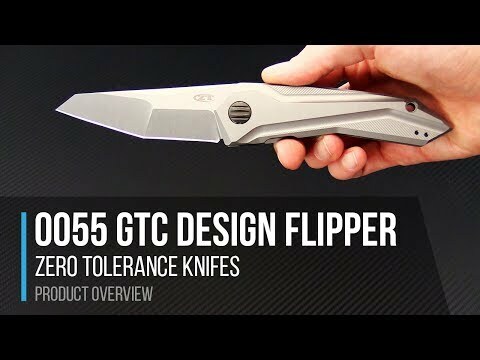 It utilizes ZT's KVT ball-bearing system and once open, the flipper tab virtually disappears. Very cool technology now available in a production model. Handle: Fully 3D machined titanium is ergonomic enough for every day with futuristic machined grooves and lines for the wow-factor. The Sprint version comes with a Bronze anodized finished with a frame locking mechanism with hardened steel lockbar insert on the back side. Aluminum backspacer construction that's been anodized black matching the subdued style of this version. Carries via a reversible, tip-up, bent titanium pocket clip. CPM-20CV: An analog to Bohler's M390, 20CV is a highly wear resistant, powder metallurgy stainless tool steel. The steel contains a large volume of extremely hard vanadium carbides, which provide excellent wear resistance. CPM 20CV contains the highest amount of chromium of any high-vanadium stainless steel currently available. The chromium-rich matrix provides outstanding corrosion resistance.